Chinese smartphone vendors Xiaomi and Vivo might not be popular names in the United States, but they both have seen explosive growth in the last few years by targeting markets like China and India. They both are known for offering budget-friendly smartphones with excellent cameras and powerful hardware. Xiaomi’s latest offering Redmi Note 7 Pro goes directly against the new Vivo V15 Pro. Let’s take a look at the detailed design, features, camera, and prices of both handsets to help you decide which one is a better buy. The Xiaomi handset measures 159.2 x 75.2 x 8.1 mm and weighs 186g. The Note 7 Pro marks a departure from Xiaomi’s metal unibody design. It features a glass back protected by Corning’s Gorilla Glass 5. 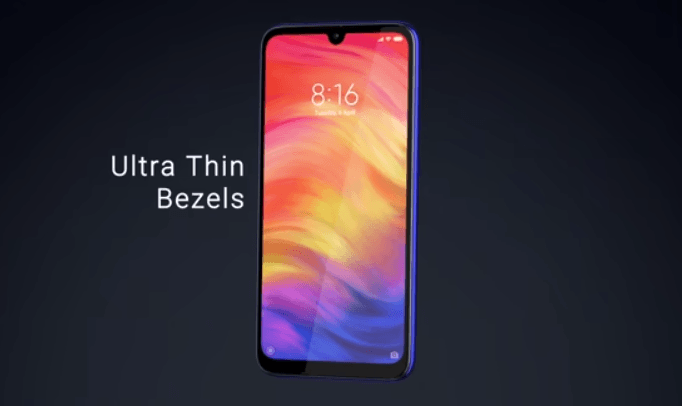 The rear panel houses a vertically-aligned dual camera system and a circular fingerprint sensor. The Note 7 Pro lacks the in-display fingerprint reader. It comes in Classic Space Black, Nebula Red, and Neptune Blue colors. On the front, it gets a tiny dot notch and a chin at the bottom. Unlike its rival, the Vivo V15 Pro has an in-display fingerprint sensor, allowing you to unlock the device by placing your finger on the screen. Though both the handsets have similar gradient rear panels, the V15 Pro’s back panel is made of textured carbonate rather than glass. The Vivo device measures 157.3 x 74.7 x 8.2 mm and weighs 185g. Vivo V15 Pro has a fully bezel-less design as it uses a pop-up slider mechanism for the selfie camera. The front camera will pop-up whenever you need it. If you hate the notch, the V15 Pro could be your device. The Note 7 Pro gets a gorgeous 6.3-inch IPS LCD panel with 1080 x 2340 resolution and 409 ppi pixel density. It has a 19.5:9 aspect ratio and 81.4% screen-to-body ratio. The screen is protected by Gorilla Glass 5. In contrast, the Vivo V15 Pro features a slightly larger 6.39-inch Super AMOLED display with 1080 x 2316 pixels resolution, 404ppi pixel density, and 84.2% screen-to-body ratio. Since the V15 Pro uses a Super AMOLED display, it delivers more vibrant colors and truer blacks compared to its LCD counterparts. Xiaomi claims to have used the best quality LCD in the Note 7 Pro, but it still can’t match an OLED panel. Both the handsets are beasts in the mid-range segment. The Note 7 Pro comes in two variants – one with 4GB RAM and 64GB internal storage, and another with 6GB RAM and 128GB storage. The V15 Pro comes in a single variant of 6GB RAM and 128GB storage. Both the handsets have a microSD card slot for external storage of up to 256GB. They both run Qualcomm’s octa-core Snapdragon 675 processor, which sits between the Snapdragon 660 and Snapdragon 710 in terms of performance. Considering the price point, the Snapdragon 675 offers great value and performance. Both the devices support dual SIM functionality and retain the 3.5mm headphone jack. In terms of software, both phones run Android 9 Pie out of the box. The Note 7 Pro gets Xiaomi’s custom MIUI 10 skin on top of Android while the V15 Pro has Vivo’s custom Funtouch OS 9 skin. The Note 7 Pro packs a giant 4,000mAh non-removable battery. It supports 18W Quick Charge 4 technology for fast charging. The V15 Pro gets a slightly smaller 3700mAh battery with 18W fast charging technology. It promises up to 24% charge in just 15 minutes. While the Note 7 Pro uses USB-C port for charging, Vivo continues to use the micro USB port. Both Xiaomi and Vivo have been flaunting the camera capabilities of their respective phones since launch. The Redmi Note 7 Pro gets a primary 48MP camera with an f/1.8 aperture and a secondary 5MP depth sensor with f/2.4 aperture. Xiaomi has used Sony IMX586 sensor for higher resolution. The rear camera setup includes dual-LED flash, HDR support, autofocus, and panorama mode. The phone features a 13-megapixel lens with AI features on the front for selfies. The V15 Pro has also made headlines because of its 48-megapixel rear camera. Vivo has used Samsung ISOCELL GM1 sensor in its phone. The V15 Pro has three cameras on the back – a 48MP primary lens with an f/1.8 aperture, an 8MP wide-angle lens with an f/2.2 aperture, and a 5MP depth sensor with an f/2.4 aperture. For selfies, the phone gets an impressive 32MP pop-up camera that comes up whenever you need it. Both phones cater to the mid-range segment, but the Vivo V15 Pro costs twice as much as its rival in India. The Note 7 Pro has been priced at INR 13,999 for the 4GB/64GB model and INR 16,999 for the 6GB/128GB variant. 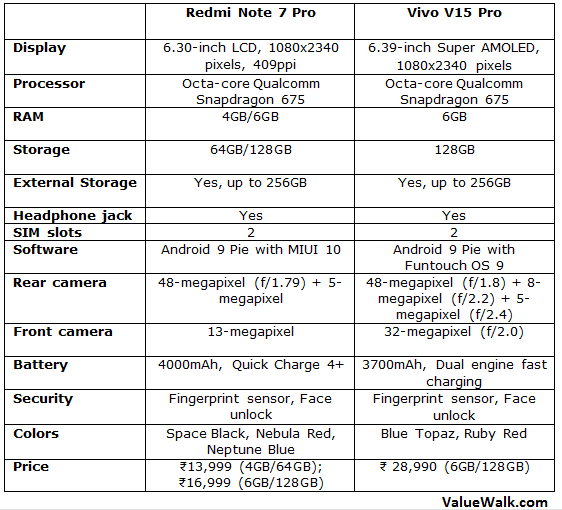 In contrast, the V15 Pro costs INR 28,990 in India. The Redmi Note 7 Pro is as good as Vivo V15 Pro in most aspects but it lacks some cool features. For instance, it doesn’t have the V15 Pro’s 32MP pop-up selfie camera and the Super AMOLED display. But considering it costs only half as much as the V15 Pro, you have no reason to complain.